Welcome to the Pratt Museum's Community Gray Whale Skeleton Project In Homer, Alaska ~ July and August 2012 Where all may witness the progress (and process) as community member volunteers of Homer, Alaska, articulate a 37-foot-long gray whale skeleton. 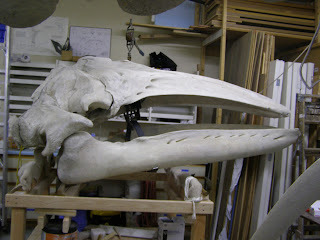 Well, gray whale skeleton fans, your Blogster keeps asking, "Is it done yet? Is it done yet?" but I'm starting to believe that this is one of those never ending projects that come along every so often. . .BUT! 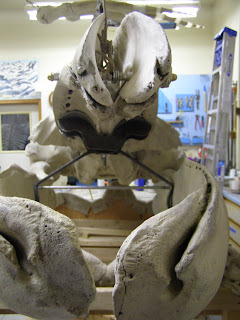 . . .For the most part the whale skeleton is finished. . . EXCEPT! . . .For some fussing and primping. The skull cradle is now finished, thanks to the expertise of Glenn and his crew at Glenn's Welding of Homer, Alaska. They fabricated the special cradle to the specifications of a template created by Marilyn Kirkham. Yesterday, Lee worked all-by-his-lonesome (with some intermittent help from Art, in between Art's many other duties there at the Pratt Museum) to get the metalwork just right for the jaws, that will attach them to the upper part of the skull. 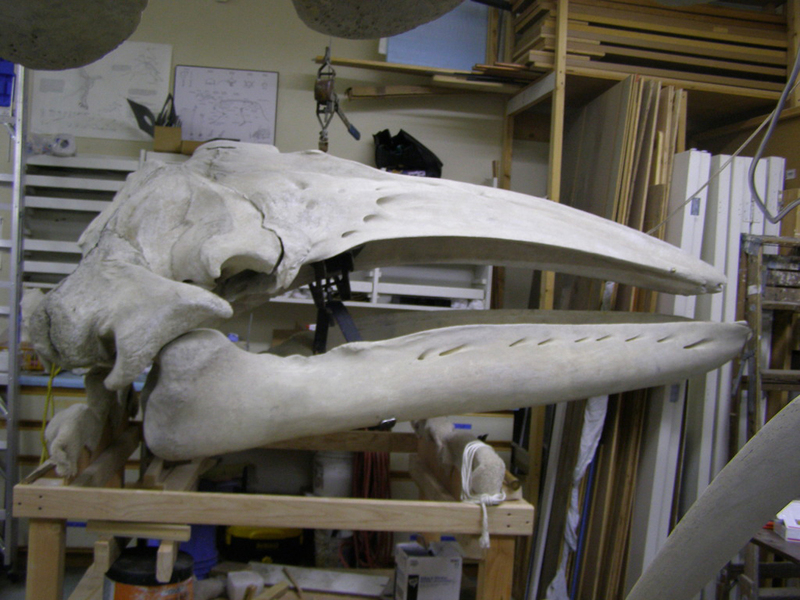 The primping that still needs to take place is: painting of the metalwork, attaching the jaw to the upper skull, inserting a rod between the mandibles (jaw) to hold them together, a few adjustments to the chevrons to get them in perfect alignment, and finish the outer tail sculpture. Once those things are completed, then the whale skeleton will be--as we say in your Blogster's world. . .done-done. We will continue to post photos and comments until then. And of course, there will be a final state of the whale address by Lee. 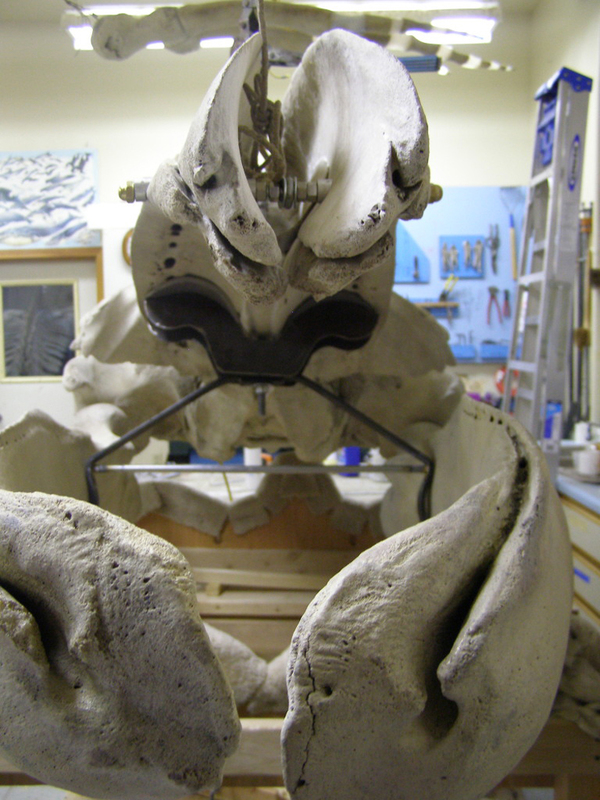 An interested reader asked why the whale skeleton won't be on display at the Pratt Museum until January. 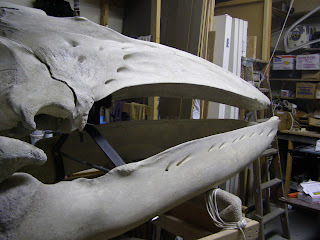 The whale skeleton will be hung in the museum's gallery in January (a major production in and of itself), when the museum is closed for renewal purposes. The skeleton is to be part of a temporary exhibit that opens in the gallery in February, so that is why it won't be hung until then. Say AHHHH! 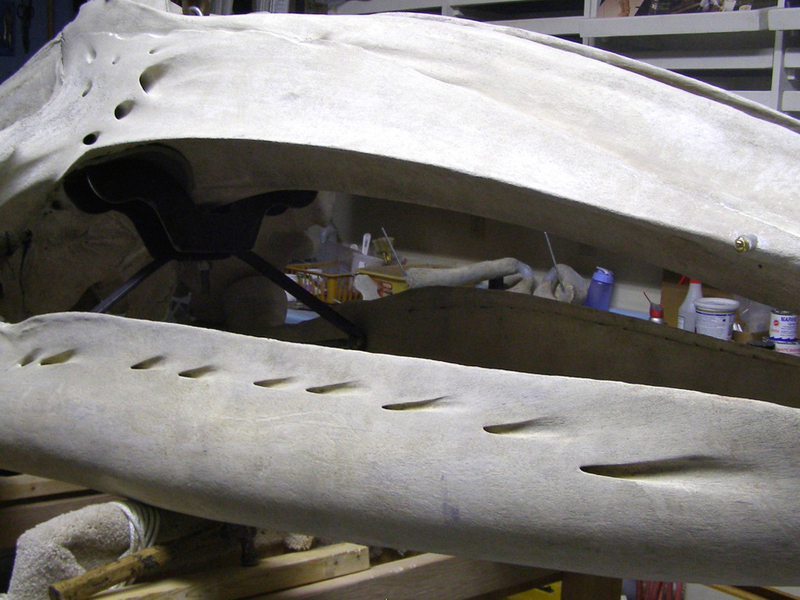 You're standing in front of the whale at the tip of its nose, looking into the mouth of the whale's skull. The upper metal piece is the skull cradle and the lower metal piece is the jaw holder-upper. These two photos show the skull and jaw placement, with a look at the metalwork at different angles. Once the metalwork is adjusted "just right" it will get a coat of paint. Perfectly balanced, this whale skull swims again.